On reflection, while Jeff Lemire's run on Green Arrow was a well-written series, I think I'm enjoying Andrew Kreisberg and Ben Sokolowski's run a little bit more. That's a bold statement after two issues, I admit, but the new writing team brings a sense of fun to the material that Lemire didn't and that sense of fun is something that Green Arrow needs but has sorely lacked for a long time. Don't get me wrong - I loved Lemire's run and its gripping sense of drama. But The Outsiders War, while setting up a grand mythology in the tradition of the ninja clans Frank Miller added into the canon of Daredevil. didn't really feel appropriate to Oliver Queen as a character. 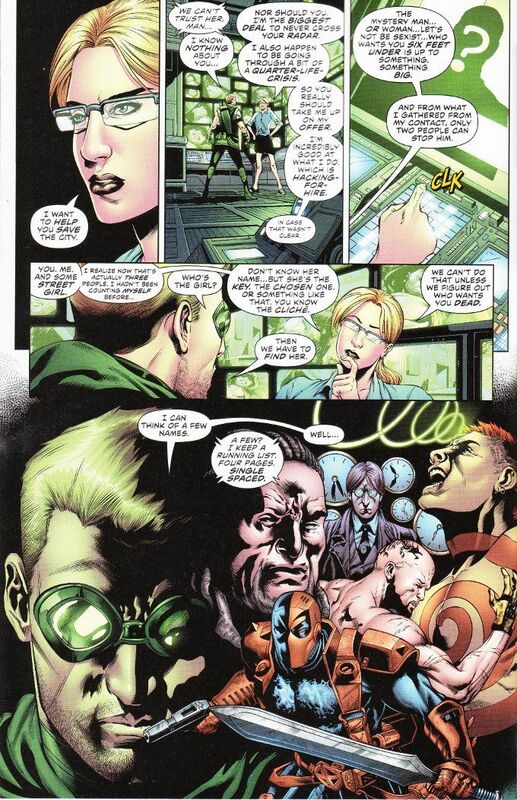 The storyline also turned Oliver Queen into a passive character in his own book, frequently confused and shunted from one information dump to the next as other characters explained what was going on. On the surface, that seems to be true of Green Arrow #36 as well. Very little of the action until the end of the issue involves Oliver Queen and our hero is in the middle of getting a huge information dump from Felicity Smoak when we first see him. And why is Felicity delivering all this information? Because she was hired to kill Green Arrow, but had a change of heart about the job and decided she'd rather work for him doing good things instead. Unlikely? Yes, but John Diggle and Oliver Queen are both appropriately skeptical and cautious, even as they acknowledge that Felicity's knowledge is proving useful. Besides, they'd have no idea she was a hacker for hire unless she'd told them, so that proves she's trustworthy... right? Another difference between two runs is that the story here makes greater use of the Green Arrow mythology. Whereas Lemire utilized names while refining concepts, Kreisberg and Sokolowski stay truer to the classic form. 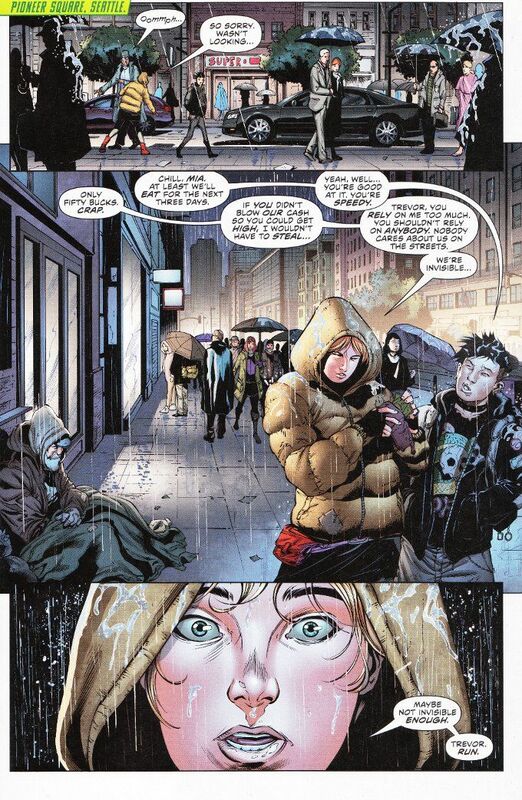 This issue finally gives us our first glimpse of homeless teen Mia Dearden and her attitude is ripped right from the pages of Kevin Smith, even if her circumstances are different. than that of the Pre-New 52 prostitute who became the second Speedy. Some fans of Lemire have groused that Green Arrow is being turned into another Arrow comic. I personally fail to see why that would be a bad thing even if it were true. And I don't think it is. Yes, some trappings of the Arrow show are being introduced but Kreisberg and Sokolowski are also introducing a number of classic elements from the original comics that have been sorely missed. The book may feel more like Arrow than it did before but it also feels more like Green Arrow than it did before. And as far as this Arrowhead is concerned, that's pretty damn good. In any case, I do not think anyone can argue against the fact that the artwork on this book is amazing. Daniel Sampere and Jonathan Glapion deliver more of the quality work that made their recent run on Batgirl so magical. Gabe Eltaeb makes everything appear bright and vibrant with his colors and Rob Leigh manages a neat effect with his lettering to emphasize Felicity's half-muttered sarcastic remarks.